Anti-arc FUZZY LOGIC control increases burning speed and reduces arcing. With high resolution linear glass scales and a 15-inch color LCD monitor. Enough memory to store up to 100'S of erosion tables and all of your favorite programs. Built-in communication ports for external program and data transfer. State-of-the-art PCBs provide robust reliability and easy maintenance. 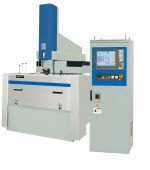 Features include Contour (3-axis) EDMing, Helical EDMing, Lateral EDMing, Orbital EDMing, and Repetitive EDMing. Work Tank Size (L x W x H) ..........................................................................46" X 27" X 13.75"
Work Table Size (L x W).....................................................................................32" X 18"
Max. 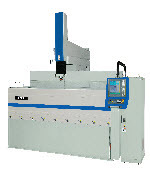 Distance from Table Top to Electrode Platen ............................................ 27"
Max. electrode weight ........................................................................................ 500 lb. 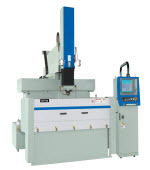 Max workpiece weight .........................................................................................2500\ lb. Generator Machining current ...............................................................................90 Amps. 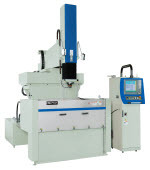 l Gromax Machines carry One Year parts and labor Warranty. l Prices and Specifications are subject to change without prior notice. l All Prices are based on F.O.B. Gromax Warehouse in Irvine, California. lAll Prices are based on F.O.B. Gromax Warehouse in Irvine, California. 3 axes 6 directions machining, multi cavities machining, circle orbiting, square orbiting, internal / external spherical machining, 45 degrees corner machining, any angle orbiting, XY, XZ, YZ, orbiting plane changable. 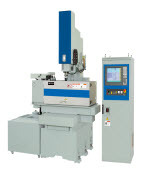 3 axes linear machining, 2 axes arc machining, helical machining electrode compensation. Contouring machining (GM code). Work Tank Size (L x W x H) 46" X 27" X 13.75" 59" X 37" X 20" 88" X 53" X 25" 95" X 53" X 28" 161.5" X 66.9" X 31.5" 161.5" X 66.9" X 31.5"
Work Table Size (L x W) 12" X 18" 40" X 24" 74" X 39" 73" X 39" 122" X 43" 122" X 43"
Travel (X/Y) 9.6" X 15.7" 24" X 18" 55" X 28" 71" X 31" 100.5" X 39.5" 100.5" X 39.5"
Max. 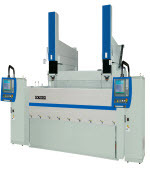 Distance from Table Top to Electrode Platen 27" 30" 42" 42" 53.1" 53.1"